Andrea Kremer and Hannah Storm are set to make history later this week, with Amazon Prime Video announcing Tuesday that the sports media veterans will become the first all-female NFL broadcast team for this week’s “Thursday Night Football” matchup. Starting with this week’s Vikings-Rams clash, Kremer and Storm will call 11 Thursday games this season for Amazon. The Kremer-Storm team adds another option for Prime streamers — with the service already offering Fox’s Joe Buck and Troy Aikman broadcast, along with a Spanish-language and an often-candid British broadcast. Amazon did not mention which reporter will handle play-by-play duties and which will handle analysis. 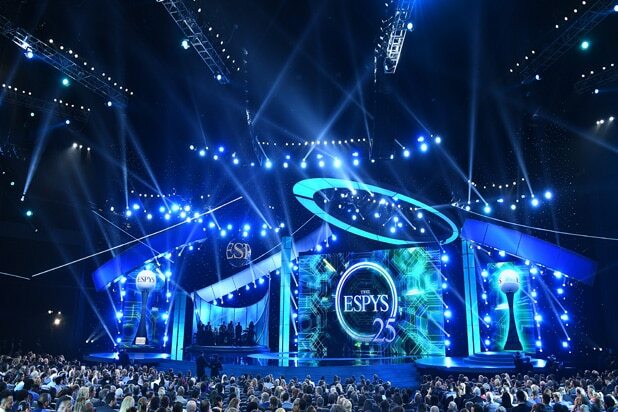 The 2018 ESPYS take place live on Wednesday from the Microsoft Theater but ESPN's annual awards extravaganza has turned into a week-long event as the biggest names in sports descend on Los Angeles -- swapping their jerseys and cleats for designer clothes and cool shoes. Olympic gymnast Aly Raisman was joined by Alison Overholt -- vice president, editor-in-chief of ESPN The Magazine and espnW - at the HEROES at the ESPYS party in Los Angeles Tuesday. Raisman graces the cover of ESPN the Magazine's special HEROES issue ahead of receiving the Arthur Ashe Courage Award with other survivors of sexual abuse committed by Larry Nassar. The Cedars-Sinai and Sports Spectacular Gala on Sunday night marked the start of ESPYS week as former San Diego Chargers linebacker Shawne Merriman joined Snoop Dogg at his Inglewood "compound" to help raise awareness about diabetes and obesity. Olympic skier Gus Kenworthy at HEROES at THE ESPYS pre-party event in LA. ESPN host Jemele Hill at the at HEROES at THE ESPYS pre-party event in LA. Paralympic snowboarder and former "Dancing With the Stars" contestant Amy Purdy was honored with the Inspirational Athlete Award, telling TheWrap that "so many people don’t even know they have diabetes so I think this is an incredible cause that raises a lot of awareness." Having overcome the loss of her legs to meningitis at age 19, Purdy is now writing her second book on inspiration, "so it is fitting to be getting an inspiration award tonight." Chloe Kim was also honored with an Inspirational Athlete Award after she became the youngest woman to win an Olympic snowboarding medal with her Halfpipe gold in Pyeongchang this year. Coming off the biggest season of his NFL career, Jacksonville Jaguars defensive end Calais Campbell said he wants to "encourage kids and talk to them about how to understand their bodies and be active, especially nowadays with so much technology available. I think playing sports is really important ... there’s a lot of lessons to be learned on how to take care of your body and knowing what your limits are," he added. Having retired in 2o12, Merriman said that "even having been done with the NFL for six years, I still love being in the gym ... There are people who didn’t have that regimen and it’s a struggle for them to stay in shape, but I always say to them ‘just stay active.'" No. 1 NFL draft pick Baker Mayfield was also on hand at the Sports Spectacular to combat diabetes. The 23-year-old QB said technology and video games have a lot of kids staying inside, but getting out and exercising is "great not only for physical health but for mental health too." As for heading into his rookie year with the Cleveland Browns, who went 0-16 last season, "people don’t have high expectations for us but we know what we have," he said. Constance Schwartz-Morini, partner and co-founder of SMAC Entertainment, was also honored with the Visionary Award for her work with clients such as NFL Hall of Famer Michael Strahan.